If you are new to a relationship, you can expect to become very familiar with your partner’s mouth. Like it or not, smooches, pecks, and exchange of oral fluids are all par for the course in the early stages of dating. This is why it’s not very surprising to learn that the top criteria for choosing a mate is good teeth. In fact, when it came to polling, 58% of men and 71% of women chose good teeth as the number one “must have” for a date, which may be as good a reason as any for wanting to make sure you have outstanding oral health. However, even if attracting a mate is not a priority, there are many other reasons for wanting to keep your mouth healthy. Studies also show that those who practice healthy oral hygiene have a much larger chance of keeping their teeth. So, whether you want to keep your love life thriving or whether you want to keep your choppers where they are, here are some tips for oral health maintenance. Keeping your pearly whites pearly white is the first step to keeping teeth in prime condition. The American Dental Association advises these brushing tips. Be sure to do a thorough job, don’t rush it. Make sure you have a fluoride toothpaste and a brush with soft bristles that fits comfortably in your mouth. Battery operated and electric toothbrushes can reduce plaque and gingivitis, a mild gum disease, more effectively than regular brushes and can also be helpful to those who have arthritis or other problems which make brushing difficult. Hold your brush at a slight angle with the bristles pointed toward the area at which your tooth and gum meet. Use gentle back and forth motion, brushing the inside, outside, and chewing surface of your teeth and tongue. Rinse your toothbrush after every brushing and store in an upright position, allowing it to dry before using it again. Separate your brush from other toothbrushes to prevent contamination. Note that while some brushes come with covers or containers, it is best to avoid routine use of these storage devices, as they can accelerate the growth of mold, yeast, and bacteria. Aim to replace your brush or the head of your battery operated or electric brush every three to four months, or sooner if it begins to look frayed. Daily flossing is the way to reach the spaces under your gum line and between your teeth. The following are a few ADA flossing basics. Aim to break off an 18 inch thread of floss. Wind most of it around the middle finger of one hand and the rest around the middle finger of the other. Grip the floss between your forefinger and thumb. Use a gentle rubbing motion to guide the floss between your teeth. Avoid snapping the floss into your gum line, instead try to curve it against the teeth where they meet your gums. After sliding the floss into the space between your tooth and gum, rub the side of the tooth in a vertical motion. Unwind fresh floss as you move through your mouth to the rest of your teeth. If you find it difficult to handle floss, there are interdental cleaners, such as pre-threaded flossers. water flossers, dental picks and silicone plaque remover that can do the job just as well. Besides regular brushing and flossing, you may want to incorporate the use of a fluoride containing mouthwash into your oral routine. Also, try to avoid using toothpicks or objects that can cause injury to the gum and allow bacteria in. 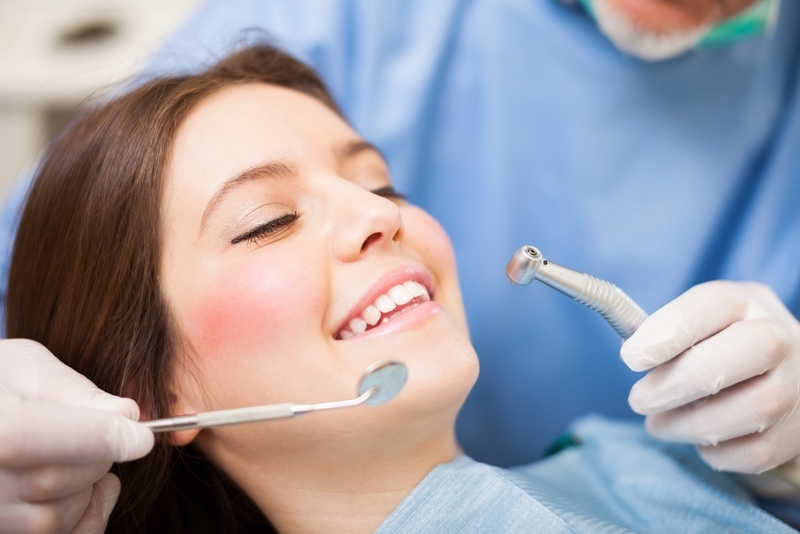 No matter how well you take care of your teeth, it is always important to see a professional regularly. Mouth sores and ulcers that don’t heal in a timely fashion. We wish you good brushing and great oral health! Let us know how you keep your teeth in shape. We love to hear from you!